The Alfa Laval Rotacheck is a highly innovative machine designed to validate the rotary impingement cleaning process inside sanitary tanks. Compliant with 3-A and EHEDG standards, the Rotacheck fulfills the demands of cleaning verification in the brewing, pharmaceutical, personal care, food and beverage, and dairy processing industries. During CIP, the Rotacheck stores time and pressure data, automatically calculating the cleaning process’s feedback. A light indication is integrated into the field housing offering this visual feedback to operators and maintenance staff on site. The Alfa Laval Rotacheck is an intelligent sensor that validates the rotation of the Alfa Laval rotary jet heads during the tank cleaning operation. Designed for use in all types of hygienic tanks, it is approved to carry the 3-A symbol and the European Hygienic Engineering & Design Group (EHEDG) symbol. It is available in two versions, Rotacheck Basic and Rotacheck+, both of which are approved for use in potentially explosive environments in Zone 0/20 in the product wetted area and Zone 2/22 in the non-product wetted area. The Alfa Laval Rotacheck is built upon patented technology and mechanical design. It features a special sensor that accurately and precisely registers, monitors and evaluates the rotation and impact of the rotary jet head. Whenever any deviation from the original rotation or impact pattern is detected, it automatically sends an error signal, enabling the control system as well as the operator to take remedial action to restore optimal operation. The Rotacheck system may also be used with PW (purified water) and WFI (water for injection) as well as in systems that are pressurized during CIP. With Alfa Laval Rotacheck, plant operators and maintenance staff can easily monitor and verify proper rotary jet head function as well as safe and efficient tank cleaning operations. A visual indication light integrated into the field housing displays the status of the rotary jet head. Digital outputs enable effortless connection to any control or PLC-system, providing secure online monitoring of tank cleaning operations at the plant at all times. The Rotacheck system uses the Alfa Laval Hygienic tank connection, which minimizes microbiological build-up and ensures a fully flushable process connection. EHEDG-approved and authorized to carry the 3-A symbol, the HTC connection is one of Alfa Laval’s new hygienic process connections. Rotacheck+, an advanced system with a built-in function for validation of the rotary jet head. Rotacheck Basic, a standard system suitable for validating the rotation of the rotary jet head and for retrofitting of Rotacheck systems that are already installed. The Alfa Laval Rotacheck control and validation system for tank cleaning machines consists of a sensor unit with top cover, o-rings and electrical cable and/or connector. The sensor unit has a sensing device located inside the processing tank and is connected to a sensor board, which processes and communicates the signal to the PLC. 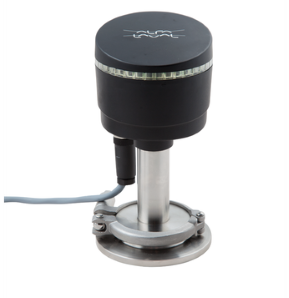 The Alfa Laval Rotacheck system is available in two versions with digital sensor output via PNP interface to and from a PLC. This advanced innovative system features unique built-in teach-in and monitoring functions to verify the proper rotation of the rotary jet head. As the rotary jet head performs the first CIP (cleaning-in-place) cycle, the sensor registers time and pressure data from the cleaning process and stores them as reference data. The reference data represent a unique pattern for a specific cleaning process in terms of the water jet intensity on the tank wall (hits) and the time between the hits from the water jet. During subsequent CIP cycles, the processor in the sensor board then compares actual values to the digitally stored reference values and alerts the operator if any deviation from the reference values occurs. Rotation OK: When the operation of the rotary jet head meets the values recorded during the initial CIP cycle, verifying the proper rotation of the jet head. Alarm: When the rotation of the rotary jet head falls above or below the acceptable reference values recorded during the initial CIP cycle. Idle: When the rotary jet head is not in use and cleaning is not being performed. This standard system is suitable for validating the rotation of the rotary jet head. Ideal for retrofitting of Rotacheck systems that are already installed, Rotacheck Basic registers the moment when the sensor head is hit by the cleaning jet. Hit: The moment in time when the water jet hits the sensor head. Alarm: In case of unit failure or constant hit (cleaning device error).